In 1967, Canada had its own special Mustang commemorating the 3rd birthday of the Mustang. Sometimes called the Third Birthday Treat hardtop it came with louvered hood, white sidewall tires, one of three colors (Candyapple Red, Springtime Yellow, or Thunderbird Diamond Green), wheel lip moldings, knitted black vinyl interior, door edge guards, rocker panel trim, and deluxe wheel covers. 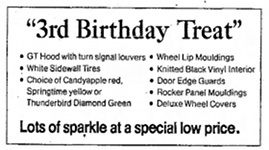 This is an advertisement for the 1967 Third Birthday Special Mustang for Canada. Several dealers participated and featured white side wall tires, de luxe wheel covers, wheel lip moldings, one of three special colors (Special T-Bird Diamond Green, Candyapple Red, or Springtime Yellow), rocker panel mouldings, door edge guards, louvered GT hood with turn-signal indicators, and knitted vinyl interior. This is part of an ad placed by Coopers Ford of Baie d'Urfe in the March 16, 1967 edition of the South Shore News of Pierrefonds (now part of Montreal), Quebec, Canada. The full ad is shown on the next page.